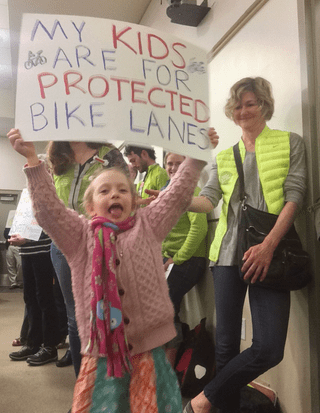 At a packed meeting last night, the Berkeley City Council approved a project to bring a long-delayed bike lane to Fulton Street, the site of a recent collision that seriously injured a cyclist. The section of road where the crash occurred is where a bike lane disappears, forcing bicyclists to merge into traffic. The city’s bike plan has long included bike lanes there, but they haven’t been high on the city’s list of priorities. The city hadn’t taken action in the past in part because putting in the two-block-long lane would require a traffic impact study. But California is in the process of updating requirements under environmental law that will allow cities to skip off-target traffic impact studies for projects like bike lanes. San Francisco went ahead and adopted the new rules already, but Berkeley has not. The Berkeley City Council unanimously approved the bike lane and called for it to be completed by Bike to Work Day on May 12. This is a huge victory for advocates and bike-riding residents, who have been pushing to extend the bike lane there since before the street was repaved last year. A concerted campaign for a protected bike lane gained momentum—and the council’s attention—after last month’s crash. Dave Campbell of Bike East Bay says that the city’s current plan to do a “very focused traffic study” should be a model for future planning. “They’re putting in the lane near the curb—they know where it’s going—and then they’re only going to study the remainder of the lanes, to figure out how to stripe the rest of the road to create as minimal delay as possible,” he said. So instead of performing a time-consuming and expensive study of how much delay a new bike lane might cause cars in that two-block stretch of road, the city will simply study how to best manage the space remaining after the bike lane goes in. This counts as a triumph for the new CEQA rules under S.B. 743, which are aimed at reducing obstacles to building infrastructure that encourages environmentally sensible travel modes. Bike East Bay is pushing for the Fulton Street lane to be a protected lane, so that bikes are separated from car traffic at that narrow spot. The council’s recommendation currently does not call for protected lanes, but Bike East Bay expects that they will be protected when they are complete. Berkeleyside has extensive coverage of the story here and here. Great news out of Berkeley and hopefully it represents a sea change in terms of how Berkeley approaches its streets. –> no street narrowing/calming. It’s just yet another standard overly wide suburban street that encourages speeding. With a big sharrow on it. –> from the windshield perspective there is no apparent upcoming diverter or any street change on the horizon. This very much encourages thru-traffic and speeding. In fact, for supposed bike-centric streets, most Berkeley Bike Blvds only have a paltry two or three diverters *on their entire ~3 mile distance*. Less than one diverter per mile is laughably pathetic in terms of discouraging speeding thru-traffic. In addition, BBBs relegate people to the backstreets away from goods and services. Very few arterials in Berkeley even have conventional bike lanes. What’s sad though is that biking in Berkeley, deficient as it is, is among the best experiences in the East Bay. My primary complaint with their system is how the Bike Boulevards cross major arterials without controls, for example California crossing Dwight or Hillegass crossing Ashby. Bicyclists are expected to stop, somehow intuit that cross-traffic does not stop, wait for a gap in 40MPH two-way traffic on 25MPH streets, and then somehow leap across the intersection, in my case on a cargo bike with two children. Those are bad designs. It seems like the only way is to dismount and walk across. For me, I am much more comfortable just taking a lane on Sacramento or College, than I am trying to negotiate those crossings on California or Hillegass. Yes! This. Even nominal bike blvds elsewhere don’t at least completely abandon you at intersections. The “design” of Berkeley’s “Bike” Blvds. right now, especially at such intersections, is unconscionable and frankly unethical. Lots of people brought up the intersection problem, the lack of on-arterial bike treatments and lack of protected bike lanes at the Berkeley Bike Plan public outreach meeting I went to last year, so I’m hoping Berkeley takes note. At least some people are aware of what’s possible in Berkeley, thankfully. I personally like having parallel bike routes, one on traffic-calmed neighborhood streets and the other a physically protected bikeway on arterials. This gives an individual the choice based on their preferences, or based on what makes the most sense for a given ride. Berkeley does need to provide much better bike access on the arterials where most of the destinations are, but keeping and improving the bike boulevards is still critical, especially for biking families. Berkeley’s bike boulevards are a grab bag, as some have traffic circles and speed humps, some don’t, some have diverters, and some like Milvia run the gamut with bike lanes, chicanes, and other stuff. I’d personally like to see some more consistency among these routes so people know what to expect, and to give drivers advance warning that these streets don’t allow through access, like you said, so non-local traffic knows to avoid them. This stretch of road was part of what neighbors in the 70s started calling the Fulton Freeway — two lanes of speed-optimized one-way traffic through a quiet residential district from Bancroft south to Ashby. Eventually the road was barricaded at Dwight Way and peace returned, but the more northerly blocks from Bancroft never received any treatment. It’s appalling that making the obvious inexpensive change here has taken 40 years. This leaves another anomalous stretch of the same street: Oxford from Bancroft north to Hearst, now a two-way/four-lane speedway forming the western edge of the traditional UC campus. An obviously-needed road diet here would better integrate town and gown while improving bike and ped uses. We should not have to wait another 40 years! Absolutely! And while Bike Blvds are a good tool (if done right, as you point out) they shouldn’t comprise the only significant element of any sizable city’s bike strategy. The bike plan that introduced Bike Boulevards said they should be implemented in three phases: 1) signage 2) safer crossings of major streets 3) traffic calming. Almost 20 years have passed, and they have only implemented 1) signage. But I think the bike plan the city is currently working on will lead to implementation of 2) safer crossings. I don’t know if they will ever get to 3) traffic calming. This change in the “Fulton Freeway” and in Ellsworth south of Dwight was the first time in history that a city ever converted a one-way couplet back to two-way streets. A couple of decades passed before other cities did the same. Yet there is no record of this change. Try googling “one-way two-way convert” and similar searches, and you will not find any mention of this change in Berkeley. I asked Bob Feinbaum, who was a leader of the movement against the Fulton Freeway, to write it up and put it on the web, but so far, there has been no response. Alan, do you remember it well enough to write it up? If so, let me know, because I would be glad to help and would put it on the web. Bike East Bay did a great job of organizing on this issue, and we should all be grateful to them. I am all for shifting form LOS to VMT for many reasons, but I don’t think it will make it easier to stripe bike lanes. I think the idea of the law is that the entire state will shift to VMT by Jan 1, 2018, and the law is meant to make it easier to stripe bike lanes until then. Unfortunately, in the case of Fulton St, it has made it a bit harder: under CEQA, we could just have had a neg dec, but under AB 2245, we must have a traffic study and public hearing. These major roads should have speed tables which double as crosswalks at BB intersections, so cars are forced to slow on approach. Caltrans would have to be on board for that on Ashby, at least. The reason why these streets are so wide may very well have much to do with the Fire Department mandating the width based on the needs for their large trucks. I would very much expect significant push back from them if narrowing the street is considered. Berkeley, despite its self-styled groovy image, has always been ambivalent about embarking on an anti-car crusade. The most cynical reason for that counter-intuitive approach is that Berkeley probably holds the national record for the amount of its budget that comes from parking fees and fines. Fully 25% of their funding comes from annexing money from drivers, one way or the other. The ageing hippies who run that town know which side of their bread is buttered.